The Rays are coming. Playing in one of the most historically top-heavy divisions in all of baseball, the Rays have found success hard to come by. With their last playoff appearance a Wild Card berth in 2013, the Rays have long been an organization with an eye on the future. 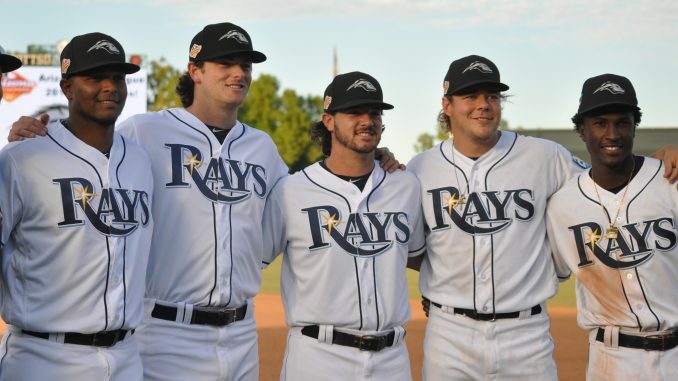 The Rays Farm System is one of the very best in all of baseball. Stocked with international gems and draftees from an innovative Rays Front Office, the Rays’ farm is exceptionally deep, and features a handful elite prospects on both sides of the ball. The Rays are committed to building a team of talented young players to develop for the future. This can be seen through recent moves, most notably the blockbuster deal that shipped their opening day starter from the last 4 seasons, Chris Archer, to the Pittsburgh Pirates in a deal that garnered a massive prospect haul. In return, the Rays received three former Top 100 prospects: Austin Meadows (MLB Pipeline #17 2017 overall prospect), Tyler Glasnow (#8 2016 overall prospect) and a PTBNL (aka Shane Baz, #76 2016 overall prospect.) A move of this caliber opened the eyes of many, including myself. Remember how I said the Rays are coming? Yea, well they’re here. This is a franchise on the rise thanks to innovative leadership and a loaded farm system. The sustained success of the prospects below and their pursuit to reach their potentials as they make their way to the big leagues will determine how high the ceiling truly is in Tampa. Like the Rays, let’s take a look at the future. If you don’t already, get to know the name. Wander Franco is a superstar in the making. The über prospect signed with the Rays on the opening day of the 2017 International Signing period and has set the baseball world on fire since. The Rays first caught a glimpse of Franco in 2014 while scouting another international prospect at the time, Jesus Sanchez. His Appalachian League MVP performance in 2018 was astounding for any player, especially considering he’s more than 3 years younger than the average of Appy Leaguer. In his first stateside season, Wander brutalized opposing pitchers and went on to post the highest OPS (1.004) of any shortstop in the minor leagues, minimum 250 PA. The switch-hitting shortstop possesses electric bat speed from both sides of the plate, and has already displayed a consistent ability to drive the ball to all parts of the field with relative ease. Franco’s obvious advanced feel at the plate was on full display last season, as he walked more times than he struck out (27:19.) This time next year, we could very well be talking about him as the top prospect in all of baseball. Yeah, he’s that good. Sanchez was deemed the organization’s 2017 Minor League Player of the Year, and he’s continued to live up to the massive hype surrounding him since he was signed out of the Dominican Republic in 2014. He has an incredibly athletic frame, and he uses it to his advantage as a true five-tool player. There is also a ton of upside in his swing, as his raw power is obvious in batting practice and should continue to translate to in-game power with more reps. His swing path tends to be overly aggressive at times and it would help his overall profile to walk more, but exposure to more advanced level of pitching should help him adapt his approach. Sanchez ended last season as the youngest player on his AA squad, so improvements should be expected across the board as he’s a career .306/.347/.478 hitter in four minor league seasons. His upside is practically limitless, and this ranking truly reflects that notion. In any other farm system we could see a prospect with Sanchez’s upside as a serious threat to the No. 1 spot. Many expected Honeywell to compete for a starting job last season. However a torn UCL suffered last February derailed the plans and forced Brent to undergo Tommy John surgery. Honeywell was named the MVP of 2017 Futures Game with 4 K in 2.0 IP. If that wasn’t impressive enough at the surface, consider the fact that the four strikeouts were against four of the best young hitters in the minor league ranks (Vladimir Guerrero Jr., Eloy Jimenez, Amed Rosario and Alex Verdugo.) He consistently attacks the zone with an advanced pitching arsenal that includes well-located fastballs with movement and his signature screwball. Over four minor league seasons, Honeywell has demonstrated a consistent ability to strike out opposing batters while keeping the ball in the zone, with a 9.9 K% and 2.0 BB%. Honeywell is back to throwing bullpen sessions and should make his way up to the major leagues by mid-2019 if his past performances are any indication of what to expect, joining an exciting rotation of Blake Snell, Tyler Glasnow and Charlie Morton. Brujan has impressed since being signed by the Rays from the Dominican Republic in 2017. Over the past few seasons, Brujan has proven that he can absolutely rake from both sides of the plate, and he’s a nightmare for opposing pitchers once on base. Vidal played most of the 2018 season for Rays Class-A Affiliate Bowling Green Hot Rods, where he was ranked elite among the Midwest League Leaders in steals (43, T-3rd), OBP (3rd), and AVG (2nd). With a tantalizing combination of strong contact skills, the proven ability to get on base at a high clip, and blazing speed, he has all of the makings of one of the game’s best leadoff hitters in the future. Some may see Brujan at 5 on this list and think that it’s too high. Going forward, I see this as his floor in a loaded system. Vidal Brujan is my pick to break out this season in a big way. Many pegged Liberatore as the top LHP coming into this year’s draft, and he’s done little to dispel that notion after a successful professional debut. Originally committed to the University of Arizona, Liberatore fell to the Rays at No. 16 overall and signed for just below pick slot value. While there is definitely room for improvement with Liberatore’s control, he’s struck out batters at an exceptional clip so far. He utilizes a balanced pitch arsenal that features multiple plus pitches with the upside for even more. He could continue to gain velocity on a high 90s fastball as he adds size to his 6’5” frame. However, my favorite of his offerings is a curveball that bottoms out hard on opposing hitters. The combination of these two elite pitches alone could stymie hitters, but he has demonstrated incremental improvement with his changeup and slider since being drafted. Liberatore has No. 1 starter upside, and there’s a good chance that he realizes this potential with continued growth. Lowe has proven himself to be an exceptional hitter since being drafted in the 13th round of the 2016 MLB draft. Over three seasons, Lowe has averaged .303/.393./476 and has demonstrated substantial improvement in power, slugging 27 HR after hitting 11 the previous two seasons combined. He’s learning how to incorporate his frame (6’4”, 235 lb.) into a quick swing that offers substantial upside in contact and power as he continues to mature. Lowe also has a knack for waiting back on the ball, and this allows him to use all parts of the field while displaying his power. While not currently ranked in MLB’s top 100 prospects (although he is #57 on our Prospects1500 Overall Top 185), a player of Lowe’s offensive caliber will continue to produce at high level against minor league competition, and could ascend the rankings quickly if the Rays keep him down. With that being said, production speaks volumes, and he’s an option for the Rays in 2019 at 1B/DH, especially after the recent trade of Jake Bauers. Fox possesses game changing speed at the plate, and there’s no question that his elite defensive abilities will keep him in the middle of the diamond. His batting line has been remarkably consistent over the past 2 years (.266/.350/.341 in 2017) and have provided some reason to fear a plateau in production, but his athleticism and projectable frame should allow these numbers to trend in a positive direction as he continues to grow as a ballplayer. Although Fox struggled against advanced competition during his stint in AA at the end of last year, adjustments should be expected as he was also the second youngest player on the team. Fox most recently impressed against some of the best prospects in baseball as the leadoff hitter for the Arizona Fall League champion Peoria Javelinas, where he batted .326/.437/.384 with 6 SB in 21 games and was the starting shortstop for the West Division in this year’s Fall Stars Game. McClanahan was initially selected in the 25th round of the 2015 draft by the New York Mets, but decided to honor his commitment to the University of South Florida instead to improve his stock. Although he experienced a decline in production towards the end of his season that slightly dropped his expected draft slot, Shane was picked up the as 31st overall player with a compensatory pick in last year’s draft. So far, this one’s looking like another Draft Day steal for the Rays. McClanahan absolutely destroyed opposing hitters during his brief professional debut, striking out 13 in 7.0 IP. He didn’t give up a run and only allowed four hitters to reach base in Rookie ball. He rips a high velocity fastball with triple digit upside, and compliments that well with two potential plus off-speed pitches (slider and changeup). Shane is definitely at his best when he utilizes all three pitches in counts to keep hitters off balance, as evidenced by a 0.57 WHIP and an excellent 1.3 BB/P. However, there were times at USF that McClanahan relied too heavily on the fastball, and that’s when he can struggle to keep pitches in the zone. All that being said, I am a big fan of McClanahan. There are many that peg him with a future in the bullpen, but noticeable improvements to his command and his downright nasty stuff convince me that he’s going to be a high-upside starter if he sticks. Now is the time to invest in McClanahan in dynasty leagues, as his price may never be this low again. Yes, I know that they are currently playing in two completely different levels, but I can’t believe how similar these numbers are either. Even having Hernandez in the same statistical conversation as Realmuto, one of baseball’s consensus top catchers, should be all the reason Rays need to be excited for their future backstop. I was honestly very surprised to hear Shane Baz, the Pirates No.3 prospect at the time according to ESPN’s Keith Law, announced as the Player To Be Named Later in the Chris Archer trade,. The talented righty has a complete arsenal and generates high velocity with a low-effort delivery. He delivers a fastball that can reach high 90s and keeps hitters off-balance with a diverse mix of sliders, curveballs, and a changeup that has made significant strides since being drafted No. 12 overall in the 2017 MLB Draft. Baz has also experienced improvements in both K/9 and BB/9 since being drafted and if this trend continues, I expect Shane to work his way back into Top 100 Prospect rankings going forward. The first prospect on this list to reach the majors, Lowe just makes the pre-season list with 129 AB in 2019. Lowe has demonstrated consistent development at the plate since his professional debut in 2016, simultaneously increasing his on-base and power production. He set new team Class-A+ record for OPS (.927) in 2017, and even improved on that number with a .949 OPS between AA and AAA in 2018 before his promotion to The Show. Lowe’s ability to play multiple positions at a high level (second base and outfield) and his previous exposure to the majors help his chances to make a consistent impact in the major leagues sooner rather than later. Before being acquired last May in a three-team deal, Poche had dominated opposing hitters for Diamondbacks’ AA-affiliate Jackson Generals, with a 0.00 ERA with 23 K in just 11.0 IP. Fortunately for the Rays, these dominant numbers seem to be the Poche standard. Poche’s fastball is unmistakably his best pitch, and although the the radar gun usually reads 92-93 MPH, high spin rates and an unorthodox release point allow the ball to move deceptively fast towards the plate. Poche boasts some of the best pitching ratios in the minors and has shown a remarkably consistent ability to stymie hitters at each level. If this trend continues, and the talented lefty has given us little reason to believe it will not, it will only a matter of time until he’s a fixture in the back-end of Rays’ bullpen. This ranking is all about projection, and a deep-rooted trust in the Rays’ minor league system to develop talented arms. Acquired as one of the top international prospects during the 2018-2019 offseason, Gaston has a rocket for a right arm and could be the ace from this year’s class. Gaston possesses a 70-grade fastball and features elite velocity for any pitcher, especially for his age. The concern with Gaston, however, is his control. There are many that believe this may be Gaston’s downfall and that it may stunt his growth as he continues to grip and rip his fastball. The key to unlocking Gaston’s massive upside in my opinion is the growth of his secondary pitches. His repertoire also includes a slider and changeup, two pitches that are definitely a work in progress. There’s little to go from here stateside, however projecting Gaston’s upside could reasonably resemble that of another top minor league flamethrower, Brusdar Graterol. The Rays acquired Solak in 2017, and he’s continued to succeed in the minors. Solak is a very well-rounded prospect and is another athletic Rays minor leaguer that has increased value with the versatility to play 2B and OF. He’s demonstrated the ability to make consistent line-drive contact as he’s moved up the minor league ranks. Solak is also becoming more aggressive on the base paths, and it’s paid dividends, increasing his steals total in each of his three professional seasons. He may not be the sexiest prospect in the system, but he may be one of the the safest. I’d expect Solak to see the big leagues for the first time in his career at some point in 2019 as a utility player, with the upside of an everyday guy if he can continue to progress. Gomez broke out in a big way in 2018. After not playing any more than 53 games in 2015-2017, Gomez played a much more complete 122 games in 2018. This has allowed us to get a better look into the player he can be, and I’m impressed with what I’ve seen so far. He has some pretty serious raw power, and that will be his X-factor going forward in his development. The high strikeout and low walk rate are definitely a points of concern, but they seem to have a correlation with Gomez posting his highest power totals since. 2019 will be a big year for Moises, and if he can to post power numbers of this caliber with a marked improvement in plate disciple, he’ll be considered one of the very best prospects in the system. “Center fielder, advanced hitting approach, has some power to all fields, can go the other way better than most high school kids. A lot to like about this guy, and a really good high school player with upside to add to our system.” – Rays’ Senior Vice President of Baseball Operations Chaim Bloom on Nick Schnell. Drafted as the #32 overall pick in the 2018 MLB Draft, the Rays have high hopes for Schnell. So high in fact that they paid slightly above pick slot value to ensure he would not honor his commitment to the University of Louisville after his stock took off in Spring of his senior year of high school, batting .535 in 31 games prior to being drafted. He even had a sizzling stretch of 7 HR in 14 PA. He’s a natural athlete with a sweet left-handed stroke that will continue to gain power as he grows into his 6’3” frame . Schnell has plus speed that plays well in the outfield, but needs to learn how to use it more efficiently on the base paths, as he’s successfully stolen a base in only 25% on his attempts as a professional. Since entering the Rays system as an international signee in 2014, Linares has been very effective for the organization’s lower level affiliates. Linares’ best pitches at this time are probably a high-end curveball and respectable changeup. He generally sits in the low 90s with his fastball, which makes his excellent K/9 rate in 2018 stand out even more. Although that may not represent his most effective offering at this time, he is young enough to project an increase in velocity with proper development as he ascends up the Rays’ minor league ranks. This should also help improve his ratios, as an increasing fastball speed will create a larger gap between the velocities on his offerings, and that will make him even more effective against opposing hitters. Linares has been particularly effective against left-handed hitters, as he’s held them below the Mendoza line over the last two seasons. Some see Linares as a future reliever for the Rays, but I trust the talent. I’m looking forward to seeing how he fares this year with more innings and an increased workload. McCarthy has exhibited an advanced feel at the plate with the ability to consistently get on-base during his professional career, averaging .390 OBP over four minor league seasons. McCarthy performed relatively well in limited action last season due to injuries, but one thing that stood out was a substantial increase in power production. Last season, he matched his previous career high of 8 HR in (430 PA in 2016) in less than half the trips to the plate (191 AB). It’s also worth noting that the improved production in 2018 came against the most advanced competition he’s faced to date in Class-AAA. Depth in the Rays’ outfield may lead to McCarthy occupying a reserve role at the next level, but all indications seem to be that he’s ready for the challenge. Next stop? St. Petersburg. Whitley was selected No. 13 overall by the Rays in 2015 and got off to a slow start, ending the year with a .174/.293/.312. As evidenced by his slash line above from his most recent season (2017), Whitley has made some serious adjustments. Although there is indubitably room for improvement with his plate discipline, his numbers are up across the board. He does exhibit an intriguing speed-power combo with the strides he’s made. 21 SB matches his amount from the previous season (2016) and the 13 HR from 2017 in 426 PA far exceed the 1 HR he hit in 292 PA in 2016. His speed provides him with ton of range to make plays in the outfield, and that only adds to his upside at the next level if he is able to maintain improvements at the plate. Gibaut was drafted in the 11th Round of the 2015 MLB Draft after he impressed in a bullpen role for three years at Tulane. Gibaut has continued to play well in the same role for his new organization and is another reliever in the Rays’ system that possesses some serious upside. He’s been very effective in a late-inning role, allowing an opposing batting average of .201 through four minor league seasons. This continued success, accompanied by career bests in ERA and WHIP last season, have me ready to believe that Gibaut could be a difference-maker for the Rays’ bullpen in 2019. Banda pitched well for the Rays and AAA-affiliate Durham Bulls early last season after being acquired by the Diamondbacks in February. However, he season was cut short by a torn ligament in his throwing elbow and he was forced to undergo Tommy John surgery in June. This general recovery timetable for the procedure will limit Banda for most, if not all of the 2019 season. With better pitching depth than recent years in the majors and atop the farm, the Rays would be wise to take their time with Banda’s recovery so that he can recapture the form that made him the Diamondbacks No. 2 overall prospect in 2016. Lowe was Georgia’s High School Gatorade Player of the Year before being taken with the 13th overall pick by the Rays in the 2016 draft. Lowe was a two-way prospect, but the Rays were intent on selecting him as a hitter. His 6’4” frame profiles to gain more strength as he matures, and that will only help his production and in-game power. Lowe has recently displayed a serious ability to steal bases, with 40 over the last two seasons, compared to only 2 in his 2016 professional debut. He also improved on his 28.4 K% and 8.3 BB% from 2017, positive indications that his plate disciple may be trending in the right direction. If Lowe can improve his K%, it should result in more opportunities for him to display the hit-tool that made him so coveted out high school just a couple years ago. De Leon was drafted in the 24th round of the 2013 draft, and hit the ground running. Once ranked as the #23 prospect in all of baseball in 2015 according to MLB Pipeline, there is definitely immense promise in De Leon’s right arm. However, injuries have derailed what seemed to be a quickly-ascending trajectory to big league relevance. He has been in the majors twice, but had not been successful in either stint. De Leon missed the entire 2018 season as he underwent Tommy John surgery to repair a torn UCL before the regular season started in March. De Leon was officially activated from the DL in November, and the progression of his rehab this offseason will determine how early, and often, we see him on the mound this coming season. There’s a lot to like so far from Frank’s professional debut. To start, he walked more than he struck out in 2018 (33:28). Granted it was in relatively small sample size, that almost seems too good to be true. However, taking a look back at a larger sample size would indicate this patience is the norm for Frank, as he had more walks than strikeouts during all 3 years of college at Florida Atlantic University. This plate discipline has allowed his hit tool to continue developing into a very solid asset. Although there may not be a lot of power in his swing, his approach is advanced and should allow him to move up the farm system in short order. Fun fact: Frank was high school teammates at American Heritage School in Florida with Lucius Fox and Jonathan India. Drafted in the 3rd round of the 2016 draft, the talented switch-hitting shortstop rebounded from a disappointing 2017 season for A- Hudson Valley (.213/.330/.287) to post a gaudy slash line in 2018. It looks as though Walls as tightened up his batting stance, as he waits back patiently to square up the ball. Walls routinely impresses with his plate discipline and it has shown even more apparent as of late. He cut down his strikeout rate dramatically against a higher level of competition in a much larger sample size (27.0 K% in 197 PA in 2017, and 14.8% in 540 PA in 2018). We should all be excited to see where this trend leads. The future looks bright for Mr. Walls. Mercado has a fastball that generally sits in the low 90s, but projects to add velocity as he continues to develop his large, yet noticeably lanky 6’4” frame. His arsenal features three additional breaking pitches, with a hammer curveball offering the most upside of pitches. Mercado experienced regression against more advanced competition in 2018, but the young right will have plenty of time to refine his skills with the Rays player development staff. Although he should be given the benefit of the doubt as he was drafted as a project pitcher, something tells me these next couple seasons will either propel Mercado up these rankings, or drop him out entirely. The Rays drafted Strotman in the 4th round of the 2017 draft after they were impressed by early returns from his transition into the starting rotation from the bullpen in college. Drew made the most of his starting opportunities for the Rays in his 2017 professional debut, holding opposing hitters to a .168 AVG. Although the following season was cut short by Tommy John Surgery in June, he impressed in 9 starts for Class-A Bowling Green before going down with the elbow injury. Strotman has yet to give up a HR in 96.2 career IP, demonstrating his advanced ability to limit hard contact against multiple levels. He has three potential plus pitches, and I look forward to seeing them on display when he returns to the bump. Gregorio was acquired by the Rays as the PTBNL in a 2016 deal with the Mariners. He has an athletic frame and plus speed that suits him well defensively at the hot corner. The key to achieving his potential will be how he matures into his 6’2” body, and if he is able to add power to his stroke along the way. He had his best season as a professional in 2018, a testament to the Rays ability to develop young players. There’s definitely risk in projection here, but his quick wrists, ability to make loud contact and other recent improvements pique my interest, especially if he’s able to fair well against advanced competition in the upcoming months. Acquired from the Orioles in exchange for Tim Beckham in 2017, there is always risk in trading an established MLB player for a prospect. However, early returns have paid dividends for the Rays. Tobias improved across the board in 2017 after the trade (3.94 ERA, 1.15 WHIP, 10.6 K/9, 1.8 BB/9 in 29.2 IP for the Diamondbacks, 3.08 ERA, 0.80 WHIP, 13.0 K/9, 1.4 BB/9 in 26.1 IP with the Rays). It also bodes well for his future projections that a promotion to Class-A Bowling Green in 2018 still resulted in a solid showing against advanced competition, even though he was about 3 years younger than the average player in the Midwest League. Boldt is one of the older prospects on this list and will have to compete with many talented young outfielders for opportunities going forward. Unfortunately he’ll also have to compete with himself, as he suffered an injury that ended his season in June last year and has a complicated history of injuries dating back to high school. However, when healthy, Boldt has found success over the past two years. In 2017, Boldt was among the Florida State League Leaders in average (.293) and steals (23 SB in 29 attempts). The following year he was promoted to Class-AA Montgomery and displayed an impressive improvement in the power department, as he hit more HR in 273 PA than he did in 680 PA in the previous two seasons combined. Ciuffo is a very safe defensive catcher. Therefore it makes sense that although his bat is far behind, Ciuffo has seen time in the majors for a team that has recently made changes behind the plate. Defense plays behind the plate in the majors, perhaps more than any other position, so it wouldn’t be surprising to see Cuiffo in a reserve role as a career defensive specialist behind the plate. Marte is another signee from the 2017 International Prospect pool. Marte originally inked a deal with the Minnesota Twins during the signing period, but the Rays took a chance on the No. 4 international prospect in the class after his original contract was voided when the Twin’s medical staff discovered a vision issue during his physical. He has the good footwork and range one would like to see from a young shortstop, and has the fielding chops to ultimately stick at the position. Marte has also performed relatively well at the plate in his first season stateside, displaying a smooth switch-hitting approach. It will be key to to see if the Rays player development staff can help Jelfry improve his plate discipline, as that will go a long way in determining his on-base ability and ultimate offensive upside. Drafted in the 19th round (570th overall) from Harvard this past year, the Rays may have found a gem. Rosenblum-Larson pitched exclusively from the bullpen during his professional debut, and he dominated. Over two stops, Rosenblum-Larson struck out 62 in just over 38 IP and held opposing hitters to a .150 AVG. This number becomes even more impressive when you notice that lefty hitters only hit .077 against the RHP. Simon employs an unconventional sidearm release that has kept hitters guessing. He’s one to keep an eye on, especially as the Rays continue to utilize relievers in different situations. Wong’s 2018 season was arguably his best season as a pro since he was drafted in 2013. His 9 HR in 2018 represent a career high, beating his previous best 5 HR from 2016 & 2017. He profiles similar to his brother (Kolten) as a solid contact-hitter with good instincts in the infield. Wong can definitely improve his prospects by continuing to make strides with his power stroke, as he also posted a slugging percentage over .400 for the first time in his professional career. However, Kean may find an opportunity to the bigs in Rays uniform hard to come by, as the organization is already loaded with talent at the middle infield position. Velazquez made his MLB debut in September 2018, appearing in 10 games down the stretch after a productive season in the minors. He flashed an intriguing combination of power and speed last year, hitting more HR than he had in any season since being drafted in 2012. 31 steals also represents his most in a Rays uniform, as they acquired him after the 2014 season when he posted his previous high of 50 SB. Although Velazquez finds himself at one of the deepest positions in the farm, his previous exposure to the majors make him a valuable commodity if he can fare well against the advanced competition in a larger sample size in his next opportunity. Franklin is a talented arm in a very deep organization. He impressed the Rays in his professional debut in 2016 as an 18-year old in the Gulf Coast League, and he was even better in his second season with Class A Short Season Hudson Valley. He’s seen a promotion to start each of the last 3 seasons, and he’s yet to disappoint against advanced competition. Franklin’s walk rate will be something to monitor, as he’s never been below 3.0 BB/9, but there is definitely room for growth for a pitcher of his ability. While he may not be the top arm in the system, Franklin is quickly rising through the ranks, and is one to watch going forward. Brosseau made some improvements after the All-Star Break last season, batting .221/.276/.363 in the first half and .306/.379/.539 in second half to put together a solid line to finish the season. His .290 BABIP in 2018 is low, and provides some hope that his numbers at the plate will impress even further given more luck with balls in play. Brosseau also set career high in HR and SB last year, offering a look into a potential power-speed threat that he can be if he can continue to mature against advanced competition. Expect to see him in AAA this year, where it will be interesting to see if he can continue to improve these numbers. Ostberg displayed great strides at the plate in his second season, improving on his slash line from the 2017 season (.188/.324/.224) across the board. Another impressive trend to note was his increase in power against a higher level of competition, with 17 XBH in 200 PA, after just 3 in 106 PA the year before, in which his season ended early due to a knee injury. Ostberg was selected to the New York-Penn All Star game in his first full professional season this year and has proven an effective hitter in the minors. He played DH for Class A Short Season Affiliate Hudson Valley Renegades after primarily catching during his collegiate career at the University of Hartford. Improvements indicate that the bat can play anywhere, but his position may go a long way in determining his road to The Show. Sanchez has been very effective in just his second professional season. Sanchez was named the Appalachian League Pitcher of the Week less than a week after being promoted to the advanced level last season. He throws strikes and has maintained an impressively low walk rate for a pitcher of his age. He also allowed 1 ER or less in 10 of his 14 starts last year. Look for Sanchez to continue to refine his pitching arsenal in 2019, and if the returns from 2018 are any indication, this may be a fast-riser in the system that has yet to garner much attention. Taylor was the return from the Brad Boxberger deal with Arizona in 2017. The big 6’6″ righty can reach back and touch 99 on the gun, although he sits comfortably in the mid 90s with his fastball. His repertoire also features a plus slider and a changeup in progress that keeps hitters off balance. After a couple seasons, the Rays decided to move Curtis full-time to the bullpen to accommodate his velocity and high-effort release. The move has proved profitable as Taylor has found success in the high leverage role in Class-AA, and could continue seeing similar opportunities against advanced competition in the near future as he makes his way to the big leagues. Romero was acquired by the Rays last season in the deal that sent Alex Colome and Denard Span to Seattle. Although his walk rate was high last season, he has shown a remarkable ability to keep a hitters quiet with a 2.73 career ERA across 27 career starts. Romero was particularly effective against right-handed hitters last season, limiting them to a .189 BA. If Romero can manage his ratios and reduce the amount of free passes, he could receive his first promotion in the Rays system in 2019. Kelly has displayed exceptional speed for his position. After swiping 11 bases in 2017, Kelly doubled up this season with 22. That’s more than any first baseman has had in the majors since 2016 (Paul Goldschmidt, 32). In other regards, Kelly experienced a slight downturn in his overall slash line from 2017 (.304/.399/.458). Compared to overall minors sample size, this seems like the outlier in Kelly’s professional career so far, so perhaps he will return to his statistical mean while experiencing an uptick in steals. Gray was acquired by the Rays last February from the Pittsburgh Pirates in exchange for OF Corey Dickerson. He has a smooth swing from the left side of the plate and found success in his 2017 professional debut in the New York-Penn League, finishing just ahead of Vidal Brujan in OPS. He also was given to Top Star award in the New York-Penn All-Star game that year and displayed the offensive upside that any team would love to see from a middle infielder. After a slight downturn in production during his first experience in Rays A+ affiliate Charlotte Stone Crabs in 2018, Gray should continue to adjust against higher levels of competition, especially as he matures into his projectable 6’3” frame. Cronenworth was a two-way player for the University of Michigan before being taken in the 7th round of the 2015 MLB draft. He possesses a solid hit tool, but not much power as he’s yet to hit more than 5 HR in any given season. Cronenworth is a shortstop in a loaded MI system, however he has experienced play at multiple positions defensively. Thanks to his proximity and versatility Jake could be looking at a major league opportunity in the near future. Perhaps even a return to the mound could be on the table for the former collegiate standout reliever. Hollis comes to the Rays after playing through his senior year at the University of Houston, and he’s been nothing short of sensational so far. Hollis had an even more impressive season than teammate Wander Franco and he led the Appalachian League in 2018 in AVG and OPS (1.022), was 2nd in OBP, and 5th in SLG. It’s worth noting that Connor is a few years older than most Appy Leaguers, but those numbers along with his plate disciple ratios are impressive any way you look at them. Hollis has a pretty sweet glove too, as evidenced by a couple plays he made in college that were featured on the Sportscenter Top 10. He was clearly dominant in his first exposure against Rookie level pitching and I look forward to seeing how quickly the 24-year old Hollis can make his way through the Rays system with continued success. A 19th round pick out of Penn State in 2016, Haley has performed better against each advanced level of competition that he’s faced. He’s really made some noticeable improvements last year. To start, he posted his best AVG and OBP to date last season. He’s also made significant strides as a power producer, with 7 HR last year after 2 HR the previous two years combined. Haley looks ready for another promotion, and if he continues to hit for contact and power this could be his floor in a loaded Rays system. Proctor was originally selected in the 40th round of the 2015 MLB Draft by the Kansas City Royals, but decided to attend Rice University to boost his value. Ford hit .331 in three seasons at Rice, boosting his value so much so that he was then taken in the 3rd round in the 2018 Draft by the Rays. In his first professional season, Proctor displayed a good eye at the plate and an ability to play multiple positions defensively if needed, a valuable asset for a middle infielder in this system. One of the lesser known commodities acquired in the Evan Longoria trade, Krook experienced success with the Rays after a transition to the bullpen in 2017. Krook has good size for a pitcher at 6’4”, 225 lb., and offers two potential plus off-speed pitches. He pitched very well against lefties last year, limiting them to .182 BAA, and could see time as a lefty specialist moving forward if he is unable to refine his mechanics. His strikeout numbers play up in the relief role, however it is imperative that he works on keeping pitches in the zone if he wants to remain relevant going forward, a 6.6 career BB/9 is likely way too high too achieve sustained success against advanced competition. My favorite list so far. Very well researched and written. Thanks, Irwin! Glad you enjoyed the read. No Adrian Rondon. Wow has he fallen far. Rondon fell from Tier 3 (#18 overall) in our preseason 2018 Top 50 to Tier 5 (#37) in the midseason update. His stats were down across the board and he’s shown very little improvement since his Rays debut in 2015. I do like his power potential, but he needs to demonstrate substantial progression in his game to make an appearance in my midseason update. Marvin Malone was a round 15 pick in 2018. He had setback this spring with therapy on right arm.